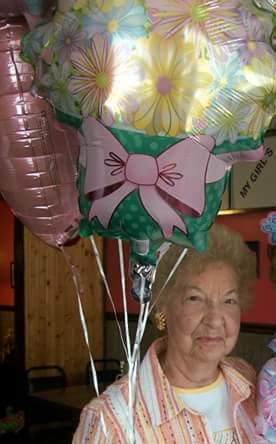 Obituary for Gladys Pascoe Rebar | Melenyzer Funeral Homes & Cremation Services, Inc.
Gladys Pascoe Rebar 89 of Stockdale died Thursday October 11, 2018 at Monongahela Valley Hospital. Born in Stockdale on August 16, 1929, a daughter of James W. and Louise Long Pascoe. Gladys was a member of the Roscoe Presbyterian Church and had served as an Elder and Deacon in the church. She was also a member for over 50 years of the Eastern Star Monessen Chapter 205, the Janet Rae Circle, and the Roscoe American Legion Post 801 Ladies Auxiliary. Gladys is survived by her son John C. Rebar and Margaret Deutsch of Charleroi, her daughter Linda Whiten with whom she made her home, 4 grandchildren; Brandee Rebar, Brittany Rebar, Brooke (Ken) Ramsdal and Sean R. Whiten, and 5 great-grandchildren; Taylor, Aidan, Anthony, Julianna and Gavin, and Debbie Rebar, mother of Brandee, Brittany and Brooke. She was preceded in death by her husband John Rebar on January 29, 1984, son-in-law Sean Whiten on August 9, 2008 and 4 brothers; James, Warren, Bill and Lee Pascoe. Visitation will be held on Sunday October 14, 2018 from 2-4pm and 6-8pm in the Melenyzer Funeral Homes & Cremation Services, Inc. 1008 Furlong Ave., Roscoe. Additional visitation will be held on Monday October 15, 2018 at the Roscoe Presbyterian Church from 10:00am-11:00am at which time funeral services will begin with Rev. Candace Cook presiding. Interment will follow at Howe Cemetery, Long Branch.